Ex-teacher Sue Hampton now has nineteen published books for children and adults, one of which, TRACES, made the top three in The People’s Book Prize 2012. Her work across a range of genres has been praised by her hero, Michael Morpurgo: “terrific” “enthralling” and “beautifully written”. Sue has made over three hundred author visits to schools, aiming to inspire children and teenagers to read and write. She also addresses adult book groups, U3As and writers’ groups with her husband, poet and novelist Leslie Tate, and has guest-lectured to trainee teachers on the importance of using good writing in the classroom. With her alopecia and bare head, Sue also likes to share the message that it’s O.K. to be different. 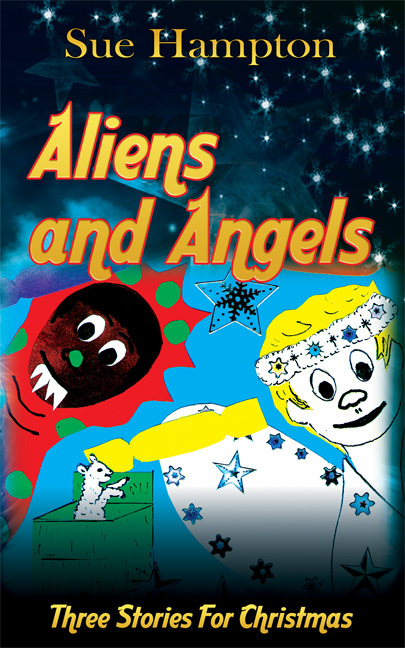 I have had the privilege to read Aliens and Angels by Sue Hampton before many other young readers who I am sure are anxious to read. I do not want to give away much of the stories because I don't want to disappoint anyone in any way whatsoever. What I can say is as I started reading the book I straight away started to get into the first story, then the second story called Not without a carrot. This story is based on a donkey called Trouble who doesn't do ANYTHING without a carrot.and oh my...the third story!!!! The third story is called Bootee for Etta. WHAT A BEAUTIFUL STORY! It creates mixed emotions throughout the story. This story was based on a little girl called Etta who was left without her parents on Christmas. You will have to read the story to understand why it was such an amazing story. This book is a great book for young readers or even as a gift for young keen readers on Christmas. It is coming out on the Thursday 26th September 2013. If you are looking for a special something for a child on Christmas, I suggest you go and buy this book in store. The colours and images of the book as seen in the image above are quite colourful and eye catching. It is for sale for £5.99. Visit Suehamptonauthor to find out more about this book. Great buy and I definitely recommend this book to anyone who has young children, grandchildren, nieces or nephews, cousins even brothers or sisters! I could easily read this book again. Great feedback Sophia, we very much appreciate your taking time to review the book. Thank you. Everyone seems to love this book and it's strange because I've realized that in a sense I am an alien! I was called one in the street once, because of my alopecia, and I saw myself as one when I first lost my hair. I'd LIKE to be an angel, in the sense that I want to help young people who've lost their hair too. Thanks for dropping by sue. Indeed a great book, deserving of every good publicity.